the Fiesta continues with A Muse! 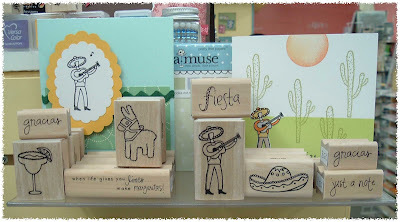 We were anxiously awaiting the arrival of some "Fiesta" themed stamps by A Muse to arrive, hoping they'd get here in time for the Fiesta last weekend... but alas, it was not to be. Our package was held up at customs and arrived last Monday! However, when you look at these adorable stamps, you want the Fiesta to continue! I know I'm looking forward to using some of them on my layout when I scrapbook a few photos from the event! Stop by and check out these sweet new stamps, as well as a few other fun ones that came with them! And watch for details about a "Margarita Monday" get together where we'll make some Fiesta themed cards & enjoy chips & salsa with some virgin margaritas! Ole!